Over the years I have tried many ways to control my paper clutter. 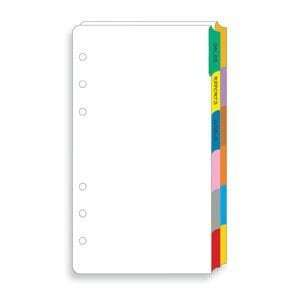 I discovered that the binder system works best for organizing important files and documents in my home. Portable: If you have ever moved file folders and the movers don’t pack them correctly (meaning right side up) you have a big mess when you unpack them at your next location. Flexible: I have stored binders on shelves, in cabinets, and in drawers. Cheap: Binders are a dime a dozen at yard sales, and even if you buy them new they aren’t very expensive. 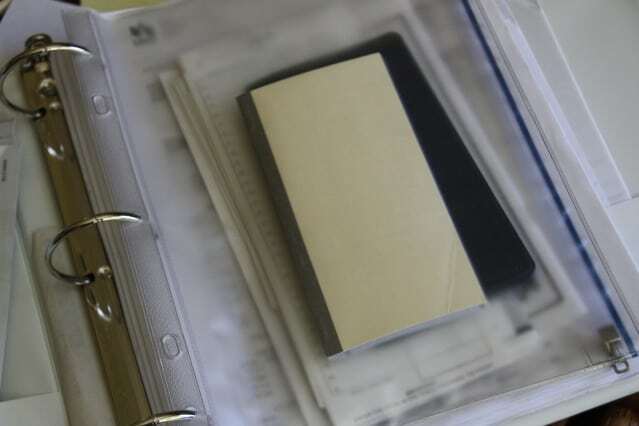 Easy to use: For me, binders make it easy to file and keep track of papers. I can’t stand “flipping” through file folders with my head bent down over the file cabinet trying to locate an important paper. Currently my binders are stored in a drawer in the office. 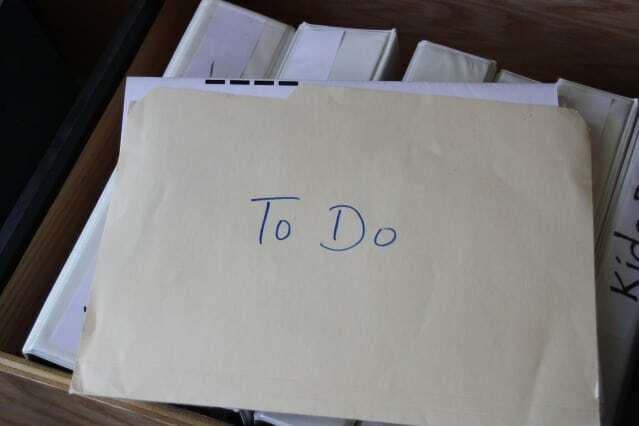 I have a To Do folder that is kept in a convenient place for immediate filing. Once a week (or sometimes once a month) I take the papers out of the folder and organize them in the binders. I use the page protectors to hold documents are more important and can’t have holes. I use the pencil bags to store small items like envelopes, used checkbooks, store cards, and receipts. About every six months I go through my binder and shred unneeded documents. I love my binder system. For me it is so much easier than digging through file folders to find paperwork. For the first time in my life, we have moved and I have not opened up a box of disorganized papers on the other end. 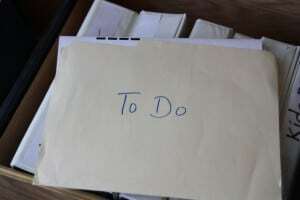 What filing system works for you? Oh My! A woman after my own heart!! I just LOVE binders! Don’t you just love the feeling of putting together a new binder system !?!? Yes, I do. I have to guard against putting EVERYTHING in a binder! My home office has 2 (five ft) shelves devoted to binders. They contain everything from bank statements to home management info to tax documents. I have been using binders for almost 30 years. So much easier than looking through a file drawer. This is a great idea. Binders would be so much easier than file folders. Thanks! I’m also a binder lover–but never even thought to use binders in place of my gawky filing cabinet. Perfect! We’re downsizing and I got rid of my TWO filing cabinets. I’ve now got a file box, but it’s in the garage. This might help me not let the pile to file get so big in the office area. GREAT idea! I love this idea! going back and redoing files is a nightmare just to even think about but even for current projects and moving forward this is a something I’d love ti implement! great idea! I need all the organizational help I can get! This is such a creative idea! do you have (And I bet you do) a binder you take with you for any time you have to move paper? For appointments etc? Think I was born organising, and the one thing I have always used is BINDERS love them! Thank you for a great article! I just started using binders too and love the concept. I started using a spiral notebook for each of my kids activities that I would bring along to meetings to take notes, etc. such as for 4H, theater, etc. I found I couldn’t add to a spiral notebook so now using a 3-ring binder and sometimes even clip in a spiral notebook if warranted depending on the need to take notes. All the papers for that club, etc. are contained on one place and are very portable to take to meetings. Thanks for sharing your system! The binder system has worked *so* well in that one area, that I really need to get some binders and organize everything else. The only thing was that I was shocked how expensive 3″ binders can be, and that’s the size I’d want for a lot of the stuff I need to keep track of. But I think if it helps me conquer the paper piles that constantly plague me, it will be worth it! I buy binders at yard sales and thrift stores. I usually never have to pay over $.50 for each. Sometimes they have some company logo from banks or insurance companies on them, but I cover the spine with my own label. I use the binders for my daughters’ homeschool work. Will try to implement a binder system to organize the desk clutter. My son was required to bring a 2″ binder to school at the beginning of the year. We found an photo album at a yard sale that fit the bill beautifully. He loved the cover design and the fact that it is different from all the plain binders in the room. This is actually kind of brilliant! I LOVE binders and my file cabinet has been giving me a headache lately. I never thought about putting that mess into binders. Great idea! Thanks! I have the “to-do” binder also. It keeps all the papers that used to get thrown into a drawer and forgotten about all together. I am re-doing my household binder. It is going to be a sort of catch all with all the important stuff that only I know – passwords, acct numbers, doctors, chiropractors. phone numbers… Kind of a “if I get hit by a truck, here’s what to do” binder! I also use a binder system, similar to yours. It works great! Our family notebook is in a three ring binder. What I like to do is to collect all the bills that come in for the month and then store them in the binder until payday comes around. That way I have everything in one spot, easy to find when it all needs paying. Now I am going to keep an eye out for binders. At the end of the school year the kids toss out all kinds of binders at the school where I work. Think I will be going though the halls at the end of the year and pick them out of the garbage. lol. My dd has done this the last 2 years and found like new binders and saved me tons of money having to buy them. Think I will have her pick a few extra for me too. Wish I thought of this one. But I will be doing this one soon. Thanks!!!! Great idea, but the hole punching would make me crazy. I use hanging files in our lateral file cabinets and inside each file is a colored folder that I can easily remove to go through when looking for something or when doing taxes. I love the COLOR more than anything which makes filing (which I really hate) actually not so unpleasant. I have never had a filing system that worked mainly because I never seem to get around to filing the pile of papers that collect on a daily basis and I am never, ever caught up. I love this idea. I can actually see this working, especially for bills and other papers. I can’t stand to file stuff and hubby doesn’t usually get around to it so everything just gets piled in a pile. Going to try this really soon- sooner the better. I just love binders too. I have binders for homeschooling info. Then that got so big that I had to divide it up into binders for each subject. Then binders for each child – for their past year’s work and for their present year’s work. Then a household binder and binders for taxes, bills, etc. Oh and a recipe binder too! I have so many binders that I needed a bookcase to house them all. Where does it end? How do you control your binder growth? I have kind of a stupid question because I find it hard to get started on projects like this: What specifically do you put in your binders? For Banking say, are you keeping your monthly statements here or something else? Investments: again is that just quarterly statements? Loving the binder idea. I had no idea there were so many other binder fans out there! Thanks for the suggestion, Toni. I totally agree that binders are easier, more convenient, less messy, and make it easier to find stuff. I have everything in one binder right now and that is working for me. I can’t believe how much paper I have eliminated by doing this. Everything is in one spot. I don’t have to run around and find information anymore. I love binders, post its and anything that has to do with office supplies. I love organizing with binders. I use them to organize my craft stamps. I’ve unmounted them from wood and stored them on sheet protectors in binders!!! Just thought I’d throw another organizing use out there for binders. Interesting. I’ll have to think about implementing this as our current filing system needs to be updated anyway. First I got a Mac and the software I had for making my files only works on PCs. 🙁 Then I got married and now we are combining files. I have a HUGE pile of filing that has stacked up because the drawer is stuffed and there’s no more room for new papers until I purge the old stuff. I already use binders for recipes, a taste file, warranties (which are too bulky for even a box file), sermon notes and in my car. Maybe this would just be the next step. 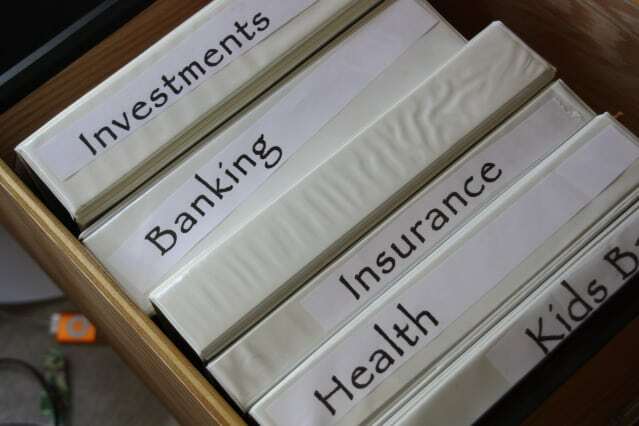 When going to the doctor, grabbing one’s medical binder instead of a file folder seems like it would be less messy–plus you’d have a writing surface for the inevitable paperwork you have to fill out! Just discovered your blog today. Looking forward to checking out more of it. I am in the middle of redoing all of my binders. The one I use the most is my school binder and my blogging binder. So, my system is a bit different, but still the same concept. Thanks for sharing! 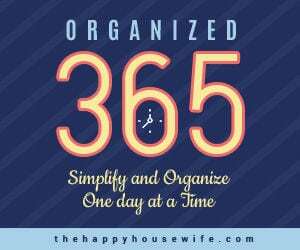 I need to be that organized lol! This is also a fantastic tip for DURING a military move! We have a “master binder” that carries several copies of his orders, vehicle titles/insurance/registration, receipts from the movers, children daycare records, dental records, even some photocopies of our medical records! It was fantastic during our last move to Germany – hubby was in school so armed with my General Power of Attorney — I did all the paperwork before the move, and he completed everything when we got here! Great idea to use it instead of a filing cabinet! This will come in handy especially during a military move! Love the binder idea! I would have never thought of it. We use file folders right now, and even then sometimes it’s hard to find something we’ve put away. I use binders for our schoolwork and I’ve used it to help with my routines. I really need to start doing this with more things. Thanks for sharing! 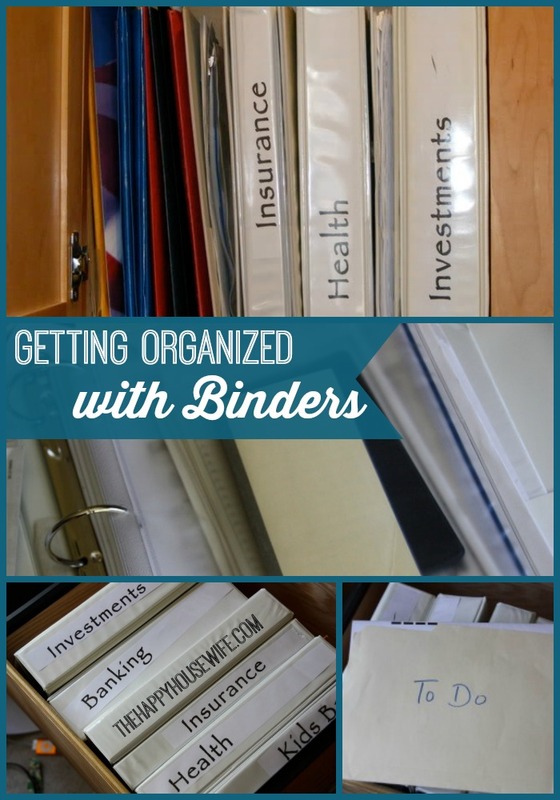 I love the binder idea, because they are much harder to lose than a piece of paper! Great idea! I use file folders, but I like the way you use the binders better! Hi there! Niki here, from over at Free 2 Be Frugal, stopping by from Works for Me Wednesday. I love your post! I am inspired to go get all our manuals and binder-ize them! Take out menus too! Stop by and visit me when you get the chance. What a fabulous idea. I can’t stand using hanging folders. They are hard to just grab and go. This idea is great because you are able to take a binder with you and file in the car or at soccer practice. Great idea. Now I have to decide to either buy some at the store or wait for some good garage sales. I’m feeling dense here. What do you put in the binders? Statements that come in the mail? 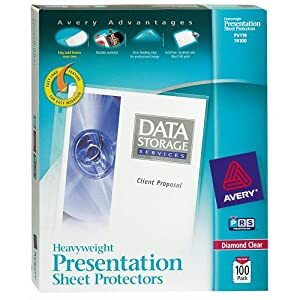 What kind of document is important enough to go in the page protectors? I would put birth certificates, insurance cards, titles to our vehicles, items that I wouldn’t punch a hole in or are small. As for the binders, I put bank statements, tax returns, insurance documents, a lease, contracts… does that make sense? I love this idea, I Have a home binder but I never thought of doing this instead of the filing cabinet. I might just have a new project to work on. Oh, and a great source of binders, may just be the dumpster behind your workplace. My husband will pull binders out the trash at work and we have another friend who gives us perfectly good binders that he pulls out of the trash were he volunteers. Crazy huh? Throwing away perfectly good binders. As a teacher and writer, I have found binders to be an essential friend. 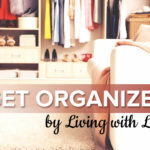 Great organizing post! I have to tell you that this system has changed my life–really! I am a piler at heart, and traditional filing systems have just never worked for me. The binders suit me perfectly! I even posted about your system at my blog. I have not perfected it quite as well as you have yet, but it’s a definite improvement for me. Thanks! Hello, I have been doing binders for a very long time. I am glad you shared this post. I have a lot of binders in the office. Never thought to bring the system home! I think I’m going to get myself some binders! Binders are an excellent idea ! Thanks for posting this great idea ! And I hate hanging folders and filing cabinets. Binders !!! I started with putting my most used household Mr Fix-it’s bills in a binder. I have the most recent bills for the plumber, air conditioning man, electrician, and keep it by the phone. I’m going to start binders for other document types like you suggested ! Thanks ! i use binders to organize all the user’s manuals for appliances and care instructions for important baby items & special clothing. It saves a lot of time and frustration to be able to quickly and easily refer to them. When my husband and I were selling our first house, I left a binder with the user / care manuals for appliances (and wood floors, cabinets, basically everything) for the real estate agents and their clients to see on their walk throughs. It impressed a lot of people. I left that binder for the new homeowner. I only keep binders for when I need the paperwork. I scan everything I can, from receipts and warranties to boxes that appliances etc come in. Instead of printouts try printing to PDF and save the files. So much can be saved to disk, including those family photos. Use the same strategy as with binders. Even better, do backups and store copies off-site. A relative’s, a cloud (internet storage), a friend’s place. If you have lost things in a move or a fire, you can appreciate having digital copies.